Someone order some beefcake with their echidna? All right, have things settled down a little bit? No? Well that's fine, I guess. No doubt you've seen the new designs for Sonic Boom. Maybe you were shocked, appalled even. To be honest so was I. But now that I've had a little while to process everything I've come to this conclusion: the new Sonic redesigns aren't bad. I know that's not that great of an endorsement. Considering I've seen comments languishing the new designs as the worst thing ever, I think SEGA can't bee to picky with their praise. I think the designs are a step in the right direction, but still slightly off course by a couple degrees. But let's start with what I think the new designs do well. First off, I think Sonic's in the hands of some very capable artists. Sonic doesn't really have that great a track record in the way of animation, and I'm saying that even though I'm a huge Sonic fan. Since Sonic Unleashed SEGA's gotten better with their animation, writing, and the general personality of all their characters, but this Sonic seem like the the best effort put forth by the company yet. I wasn't even aware Sonic could express anything other than cocky smile, mildly angry, and cocaine. The preview for the cartoon also struck a chord with me. The latest few Sonic titles have had writing that was a bit more comical, light-hearted, and tongue-in-cheek and I think that's a good direction for a game about a blue cartoon hedgehog fighting an obese mad scientist. The new cartoon seems to follow that trend, and I actually found myself smiling at the Burn-Bot bit in the preview. I'm on board with that. As for Knuckles, I'm surprisingly ok with his design now. Actually, I kind of like it. The old Knuckles was kind of an awkward design. He was basically a red Sonic with dreds, a crooked tail, and massive gloves of death. This unfortunately meant he moved just like Sonic, just with giant unruly gloves. This just led to wonky animations and fighting in his 3-D incarnations. Seriously, watch how his legs move super-fast but his fists remain almost stationary. Se how puny his attacks look and how short the range is. Laugh at his climbing animation because it kind of looks like he's snuggling the wall. And I know this is Sonic 06, but trust me, it's not much better in Sonic Heroes or the Sonic Adventure titles. Sonic Team really didn't get the concept of having characters feel different back then, leading to jarring animations and game-play. 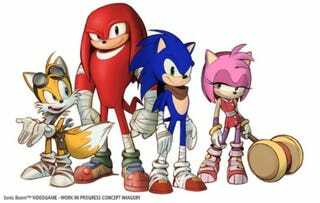 Anyway, the point is the new Knuckles looks more suited to take the roll as the muscle of the group. It actually looks like there's some weight behind the character, like his punches have power and that he's actually climbing things instead of flailing around. Plus the idea of giving your character humongous fists with tiny spaghetti arms was kind of a silly idea in the first place. There. I said it. Let's move on. Knuckles beefing up also gave the cast a bit of much-needed diversity. Most Sonic characters look a little too much like each other. Same height, same proportions, same eyes, same noodle arms. Seriously, look at this. The new designs are helping diversify the proportions and silhouettes of the characters, which considering the enormous cast of look-alikes is a good first step. However, I don't feel everything about the new designs is that great. For one thing, I think the new designs went a bit overboard with the accessories for the characters. I once wrote about how the clothing and accessories should always say something about your character. What's wrong with some of the designs is that they are trying to say something for no reason, say too much of something, or they are reiterating something that was already said. For instance, the much hated "bandages." 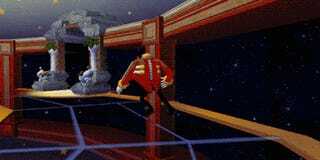 Athletic or fighter tape makes sense for Sonic and Knuckles given their speed and power. The problem is you really don't need that much tape. A little around the arms is fine. A bit on the wrists, I get. Tape all over their gloves, biceps, and shoes is going a bit too far. The same goes for Tail's outfit. I can live with goggles or maybe a tool-belt, but having those plus earphones and some strap across his chest is just too much. The one thing I'm conflicted on is Sonic's neckerchief. I don't really think it fits Sonic or the speedy-sporty motif they were going for, but I also wouldn't mind him having his own accessory. He needs something that would either help show his speed (a scarf might help, but it's look gaudy) or something that looks sporty. I'd personally go with some kind of backpack or sport tote. How could he have a backpack if he's got a bunch of spikes on his back? I don't know, but he's worn one before and it worked just fine somehow. All in all, the new Sonic designs aren't bad. I'd say they're a step in the right direction and fans just need to give them a chance. I know a big change for a popular character can seem weird, foreign, and maybe a bit scary, but I honestly think they're doing good here. So I am going to say good on you, Sonic Boom design people. You're doing alright so far, just keep at it. -Quick Quack is a newcolumn written column by Zachary Long AKA InvadingDuck. It's small and hastily written because I don't have a lot of time most of the time, hence the "Quick" in the title. Hopefully I'll have time to do bigger in-depth columns in the future. If you want, you can follow him saying stupid things on Twitter @invadingduck . Also, I don't have an opinion on the new Eggman design. He's voiced by Mike Pollock and that's all that matters.